Hey everyone, this is knwilliams319 with my first deck guide, the Miner Bowler Full Control Deck for Arena 8 and above. I’ll be going into detail about each of the individual cards and their substitutes, while also explaining the main premise of the deck. This deck has allowed me to eclipse 4000 trophies as a Level 10 F2P with 10/7/4/1 card levels. Without further ado, let’s begin! Miner: This card is extremely important to Control decks. This is the card that allows the deck to be so defense-oriented! Its main use is to counterpush, as it’s a cheap three elixir mini-tank that can be used to fortify your push. You should always switch up the placement of the Miner so that it’s guaranteed to hit your opponent’s tower. 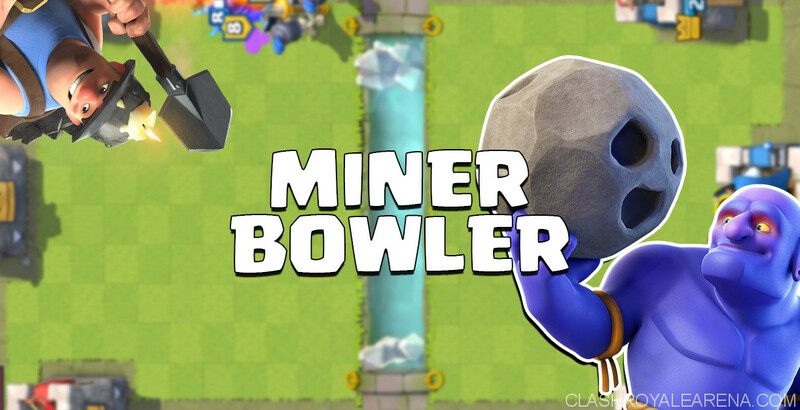 Because the Miner is often ignored on his own, even if none of the troops from your counterpush hit the opponent’s tower, the Miner is still able to chip a few hundred hitpoints off of your opponent’s Crown Tower. Do this a couple times in a game, and you’ll be able to bring their tower into Rocket-range, sealing the game. Substitutions: None. This card is extremely important to the deck, and cannot be changed. Bowler: This thing is amazing! Before this deck, I’d never really tried using the Bowler, but after using this deck, I’m regretting the fact that I didn’t try use it earlier. This card is a defensive wall! It has huge AOE damage, and its knockback is invaluable as it allows you to dissect pushes extremely easily, especially when combined with the Ice Golem. It also has slow movement speed (a common theme in this deck), allowing it to easily counterpush with. Not only this, but it has pretty high HP, allowing it to take quite the beating itself. This card is extremely useful against all ground-pushes, including Elite Barbarians, Hog Rider, and Giant. The only card it isn’t as strong against is Royal Giant, as it can’t knock it out of range of your tower and ground support with the Royal Giant isn’t super common. Substitutions: Despite the name of the deck, the Bowler can be substituted out of this deck. If you’re struggling against beatdown decks, the best substitution is Elite Barbarians. Combined, two EBarbs have more health than the Bowler and do quite a bit more damage. They’re an extremely strong tank-killer, but they don’t have the knockback, so its a bit of a trade-off. The most important thing to remember if you switch is that the EBarbs should be used on defense first. It’s easy to go off and try to use EBarbs as a win condition, and place them at the bridge and all of that, but stay disciplined. Use them for the extremely strong defense they are, then counterpush. One more thing – because EBarbs are so fast, counterpushing with them may be a bit more difficult than with Bowler. Furnace: The most control-ey card in the game (considering it’s at the proper level for the XP-level of your opponent). If it’s at the proper level, this card holds so much value because no matter what, in each group of spawned Fire Spirits, one Fire Spirit will make it to the tower, doing great damage. In its lifetime, five Fire Spirits will launch at the tower, doing insane chip damage. Because of this, this card forces your opponent to respond to you, potentially making a negative elixir trade. If they don’t respond, you get free damage for just four elixir! This card also holds value on defense, as the spawned Fire Spirits hold some pretty strong burst damage against pushes your opponent sends at you. Substitutions: I haven’t tested any substitutions, however, I believe a Tombstone could also work. I’m a level 10 with a level seven Furnace, so when I play other level 10s or even 11s, no Fire Spirits make it to the tower. Because of this, I’m led to believe that Tombstone is a better option unless your Furnace is at the proper level. Rocket: I love using Rocket. It’s simply a super-fun card to play! It will seldom be used on defense, it’s main role is to deal incredible damage to the tower. Ever heard of the phrase “Pocket-Rocket”? That phrase means that someone has revealed seven out of eight of their cards throughout the game, and reveals their eighth card (the Rocket) to deal enough damage to the opponent’s Crown Tower to finish it off (this is the only time you should ever Rocket the Crown Tower by itself). That’s normally how I play this card, I counterpush until the opponent’s Crown Tower is within one/two Rockets, and then I defend and Rocket to end the game. 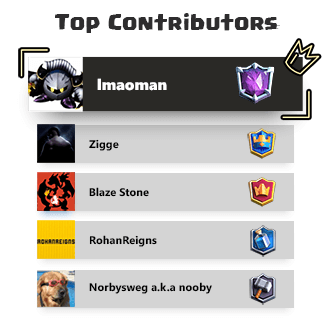 However, you can also “Rocket for value”, hitting the tower and another troop, such as Musketeer, Mega Minion, or Sparky. I also try to hold off on using Rocket until Double-Elixir time, as using a six elixir card early can put you at a bit of an elixir disadvantage on defense. I only Rocket during regular time if I can hit five elixir worth of troops and the tower. Make sure not to miss your Rocket/hit the tower by itself, or you will likely lose, as you just dumped six elixir down the drain–six elixir you don’t have to counter your opponent’s assuredly incoming push. Finally, always know how much damage your Rocket does. I’ve seen many people throw a game because they didn’t account for how much damage their spells did and launched spells at the Crown Tower and didn’t kill it, while their opponent surmounted an unstoppable last-ditch effort at them. Ice Golem: This card is hands-down one of the best in the game. It has extremely strong defensive capabilities. It can be used to pull troops, potentially separating support from the tank. It’s a mini-tank with great distraction, and you can combine it with other cards to defend your opponent’s pushes while keeping your own troops alive to counterpush (something that is extremely important in this deck). Furthermore, the death damage and slow are extremely valuable, and combined with a Zap spell can take out a lot of low-HP troops. It can also be placed in the middle of a Graveyard spell to tank some of the Skeletons and kill them with its death damage. At two elixir, it holds incredible value and cycles your deck quickly. You can read a more detailed guide, all about the Ice Golem, here. 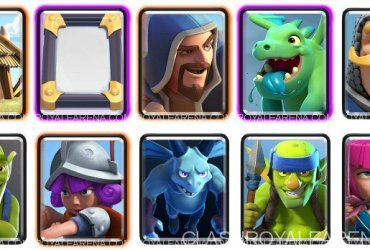 Substitutions: Ice Spirit – it is also great on defense, but the Ice Golem’s ability to distract and slow troops makes it a better fit in my opinion. Not to say Ice Spirit is a bad card! It holds extreme value at one elixir, allowing you to cycle your deck better than the Ice Golem can. I’ll say this a lot, but the choice is personal preference. Archers: These girls are extremely strong in the current meta, but especially on defense. Archers are your main anti-air. They’re also one of the best Graveyard counters in the game, and combined with the Crown Tower can stop a Graveyard spell from doing any damage. On top of this, they’re a cheap three elixir card! Combined they do surprising damage, and their slow movement speed makes them easy to counterpush with. Substitutions: I haven’t tested any substitutions for Archers, however, there should be no need for any. Archers are a common card which makes them easy to level up, and they’re unlocked right from the start of the game, so they should be caught up to the rest of your card levels. In other decks, Minions can be used instead of Archers, and that could work in this deck. Minions are also a great Graveyard counter, however, they’re more vulnerable to spells than Archers are. Plus, they’re quicker, making them a bit harder to counterpush with. While they could work, I personally wouldn’t make the switch. However, its up to you! Personal preference! Mega Minion: A staple of every one of my decks. 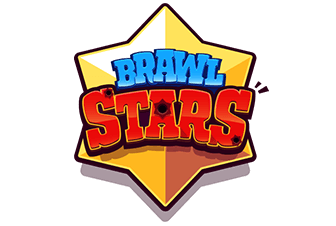 It deals incredible damage, is a great anti-air, is tanky enough to take some damage… and did I mention it costs three elixir? Even after its nerf, this card reigns supreme as one of the best defensive cards in the game. Plus, just like the Archers, it has slow movement speed which allows it to be easy counterpushed with. The timing might be a bit challenging to get down, the trick is to look at its shadow. While it won’t happen often, if one of these makes it to your opponent’s tower, they’re going to be in a world of hurt. You can read more about the mega minion here. Substitutions: I don’t suggest substituting the Mega Minion, however, it may need to be an option if you’re struggling to defend against beatdown decks (substitute for Skeleton Army) or Graveyard decks (substitute for Minions). I personally don’t struggle against these two types of decks with Mega Minion, however, you and me are different players. Don’t be afraid to make the switch if you need to. Zap: IMO this is the best spell in the game. At two elixir, this card is full of positive elixir-trades. I’m sure I don’t have to tell y’all how to use this thing. Substitutions: I personally don’t have The Log, but it can be substituted for Zap. While you lose the anti-air, The Log is definitely better against all ground troops because of its knockback and ability to kill Princesses for a positive elixir trade. The choice is personal preference. This deck is extremely focused on defense, and isn’t very aggressive. Your main goal is to play great defense, and then counterpush with your Miner to chip your opponent’s Crown Tower. Once their Tower is within one/two Rockets (or a few Miner hits and a Rocket, or a Zap + Rocket, etc. ), defend and execute your finisher when it’s safe. Aggressive plays will get yourself killed! Play patiently, this deck will take all 3-4 minutes to win. I cannot stress that enough. Thanks for reading, everyone! If there are any comments/questions, please feel free to post them in the comments section below. Furthermore, as this is my first deck guide, please feel free to leave any criticism in the comments below. I hope y’all have just as much success as I am with this amazing deck! 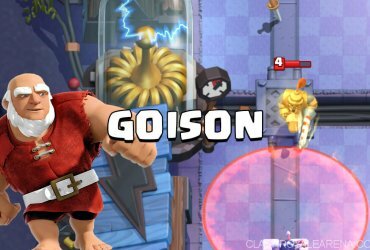 The Legendary Goison Is Finally Back!